The polling continues apace. We have 28 new polls today with changes in three states. First, Wisconsin has now switched to the Kerry column, according to a Zogby tracking poll conducted Oct 23-26. Kerry is now ahead 48% to 46% in one of the swingingest of the swing states. But with a margin of error of 4%, it is still a statistical tie there. Zogby also shows that Iowa has become a tie at 45% each, according to its Oct. 23-26 poll. Gallup ran a poll in Iowa Oct. 22-25, only a day before Zogby's, and found that among registered voters, Kerry leads 48% to 47%. However, among what Gallup believes are likely voters, Bush is ahead 50% to 46%, a surprisingly large difference. This immediately brings up the issue of how Gallup decides to reject some respondents as unlikely voters. The likely voter screen involves questions about past voting behavior, interest in the election, and knowledge of where the polling place is. Given the huge number of new voters this year, there are legitimate questions about how accurately pollsters can predict likely voters. For this reason, the spreadsheet and map just use the registered voter data where that is available. In this specific case, Zogby's poll is more recent so the issue is moot. The third change is in Arkansas, where Bush now leads again. This result is not surprising as most observers didn't think there was much of a horse race in Arkansas to begin with. 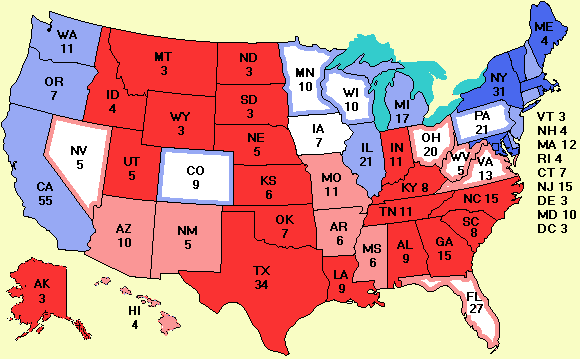 All in all, Kerry gains ground in the electoral college today, reducing Bush's lead to 17 EVs. Also noteworthy are the four Florida and four Ohio polls today although neither of those states changed hands. Of the four Florida polls, two of them (ARG and Survey USA) give Kerry leads of 3% and 2%, respectively, one of them (Rasmussen) is a tie at 48% apiece, and one of them (Zogby) shows Bush ahead by 4%. I find it ironic that all summer long I was bombarded with e-mail from Republicans denouncing John Zogby as an unreliable Democrat, but that now that he is the only one showing Bush ahead in the key swing states, the e-mail has abruptly ceased. But Zogby's poll is the most recent, so it is the one I am using. Nevertheless, trouble is clearly brewing for Bush in Florida. We also have four polls in Ohio today. Kerry leads in two (ARG and Survey USA) and trails in two (Zogby and Rasmussen). As in Florida, everything will depend on turnout. It will be very close in any case. The Los Angeles Times has a story today that explains why this election is so much more emotionally charged than previous ones. It is not about economics, but part of a cultural war. A new LA Times poll shows Bush doing well among lower and middle income whites, whereas Kerry leads among whites earning more than $100,000 a year despite his promise to roll back the Bush tax cuts for people making more than $200,000 a year. As president, Bush has enacted big tax cuts for the rich but the rich are voting for Kerry. What's up here? The same poll shows that 2/3 of the people who attend a house of worship at least once a week are voting for Bush, whereas 60% of those who attend religious services less than once a week are voting for Kerry, in part because these voters recoil at Bush's constant use of religious imagery. Lower income whites like Bush's proposal to ban gay marriage but only a quarter believe his policies have been good for the economy. In contrast, affluent whites who have benefitted the most from the Bush tax cuts believe Bush's policies have hurt the economy. In short, far more than in previous years, economic policy is taking a back seat to cultural issues. The real divide seems to be between deeply religious lower income, lower education, voters living in small towns and rural areas who have conservative values on abortion and gay marriage versus higher income, higher education, secular, urban voters who have progressive views on cultural issues. Maybe James Carville was wrong: It's NOT the economy, stupid. With this background and the fact that eight of the nine Supreme Court justices are past the traditional retirement age of 65 and four of them have been treated for cancer, it is likely that the choice of who the next president will nominate to the Court will weigh increasingly heavily on the minds of many voters as we approach election day. For more on this issue, see this story also, in the LA Times.